Those of you who know me, know that I have a thing for “G-d Winks” — moments, people, ideas and “ahas” that show up at just the right time. Today I had “a moment” – a short conversation with a nice guy in a cigar shop. What was I doing in a cigar shop? I was having a rough day. No, I didn’t pop in for a smoke. I was simply driving a bit aimlessly after realizing I had misread the time of an important event and missed it. All dressed up, and with my head swimming with my mistake, I slowly wandered home down a new street with lots of small store fronts. While stopped at a red light, I noticed a cigar store with a front bench stacked with colorful and shapely cigar boxes. Hmmmm… curious, I pulled over to take a closer look. A sign said $3 each. I was drawn to the boxes even though I had no idea what I was going to do with them. Score! I pulled my car around the corner and loaded them into the trunk. Between the store and home, an idea of what I can do with them popped up. Names popped up. And then, I realized. I don’t just notice “G-d Winks” now I was noticing “Binky Blinks” – my new name for ideas that come to me when I intuit possibility. In my exploration of NEXT, I am learning that we all make mistakes and sometimes wander “aimlessly”. I wonder if it’s not what I don’t do, it’s what I do with what I’ve done. 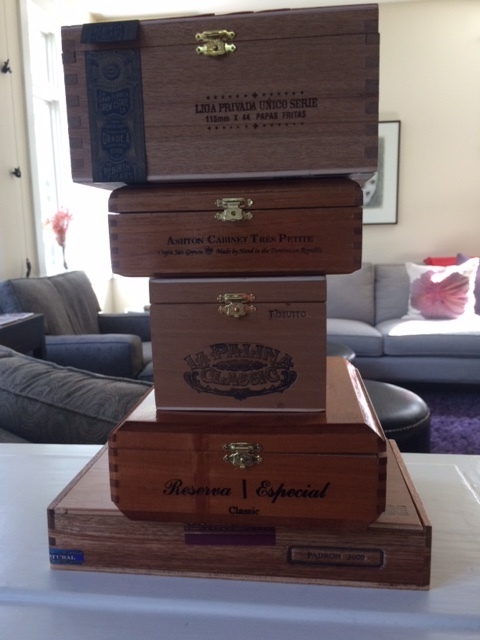 Using the cigar boxes as a metaphor for transformation, I plan to make something new of them. And the part of me that misread the time on the event? Well, my intention is to transform it and show up in a new way. Hmph. Now that the smoke has cleared, I think I can see it all a bit more clearly. Where do you see MindFULL possibilities and what do you do with them? Fun! You join a proud tradition of cigar box art. Knowing you, the results will be stunning! Good to see your post. I miss your thoughtful and inspiring words. Be well. Old cigar boxes are great for storing small amounts of stuff, treasures, and collections. Have fun with your lucky day find.